A project at the Sofitel Hotel and Spa Bahrain. Artdivano’s latest project for the Double Tree by Hilton Doha Old Town in Qatar, has given the consultancy the perfect opportunity to showcase ‘Made in Bahrain’ expertise and its “passion for art” to the world. “There is no better place than hotels – not even museums – for showcasing regional culture, heritage and traditions to an international audience,” says Afaf Zainalabedin, the managing director of the Bahrain-based firm. Art has always been part of the lives of Zainalabedin and Marion Labani, the art consultant of ArtDivano, since their early years. A passion for art brought the two women together who went on to found ArtDivano, an art consultancy based in Bahrain, in January 2013. “Our motto – ‘The passion for art’ – represents our appreciation of art in all its forms, which we now want to pass on and gift it to our clients and art lovers,” says Zainalabedin. Since its inception two years ago, ArtDivano has already been associated with key hospitality projects in the kingdom such as the Sofitel Bahrain Zallaq Thalassa Sea & Spa resort, the Majestic Arjan by Rotana Bahrain and the ART Rotana. It has also proposed its new artwork concept to the Ramada Hotel Bahrain. 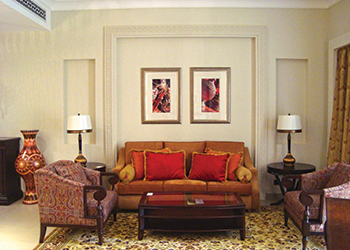 Three-dimensional paper cutwork at Double Tree by Hilton Hotel Doha Old Town. “We have developed an art programme for them and hopefully we will start work soon after the hotel renovation is completed,” says Labani. The Double Tree by Hilton Doha Old Town is located at Old Salata in Doha and the project marked the company’s debut into the regional hotel sector outside its domestic market. The project, according to Labani, was “unique” in that a specific request for tailored-made artwork had to be catered to. The products were customised, produced and installed at the project recently. “In general, for such projects we either work in co-operation with the project team and the interior designers or on our own to deliver a complete art programme from start to finish,” says Zainalabedin. The artworks were developed and reproduced proudly as ‘Made in Bahrain’. Also, the framing was selected and assembled in Bahrain by ArtDivano’s partner company and under its supervision. “This was our first overseas project and we faced a number of challenges, including the weather conditions, for shipping and storing the artworks. Despite all this, the project was delivered within the timeline,” she says. 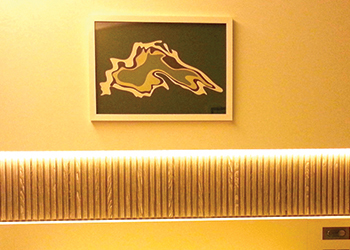 ArtDivano was contacted by the hotel’s interior designer dwp, and worked closely with its Bahrain office on a specific artwork design and framing request, which was conceptualised in 3D. It developed the artwork with the envisioned framing and later got involved in the entire artwork concept for all the rooms. For the project, ArtDivano had to take several points into consideration including the design elements, colour schemes, legal matters, export rules, the climate, the mode of transport as well as the judicious management of staff on site. Majestic Arjan by Rotana, Bahrain ... depicting Bahrain’s traditions and heritage. “The project had quality assurance and safety codes which we had to abide by. We had to work to very strict deadlines and availability, but we executed the project on time,” says Labani. The general theme provided to ArtDivano by dwp was ‘topography’ and the request was to translate this theme into works executed in water colours. “We developed and commissioned artwork based on the theme and colour schemes. Our proposed and approved art programme was inspired by the topography of Qatar and the Arabian peninsula,” Labani says. One specific requirement was that the lacquered wooden frames should match the colour of the wall paint, and ArtDivano also provided artwork frames for the mock-up rooms. 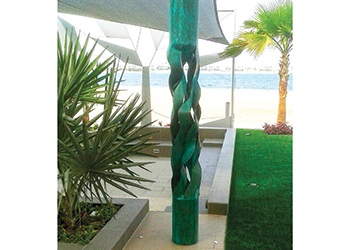 A customised sculpture for a private beach villa in Bahrain. As it was an overseas project, ArtDivano had to adapt to local work timings and fit into the client’s processes and workflow, and any changes to the schedule had to be managed accordingly. However, through one-on-one personal contact with the client, these challenges were easily overcome, says Labani. “The most challenging part of this project – and this is relevant to any other project even within our base country – was the time factor,” Zainalabedin says, pointing out that time management and mutual co-operation on tight deadlines were of prime importance. Zainalabedin adds that thanks to the extensive experience of ArtDivano’s team – in art, legal and administration matters – the company has proven that it can “successfully undertake cross-border projects”. 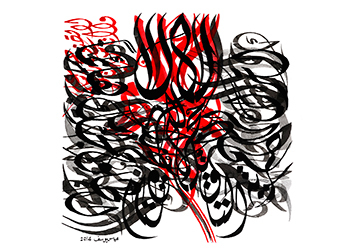 Calligraphy work by Abbas Yousif for ArtDivano. The brainchild of both Labani and Zainalabedin, ArtDivano was developed as a “unique business model in the Middle East” by combining an art consultancy with an archival print studio in addition to online gallery – www.artdivano.com – for Middle Eastern and international art, which is set for launch next month (October). “Our concept and philosophy is based on taking artworks by Arab artists and artists who have chosen the Arab world as their home or who are translating the world’s heritage and culture into a unique language of colours and materials onto a new level,” says Zainalabedin, adding that the company is driven by “strong expertise, as well as a deep emotional approach to art and a belief that art without passion is nothing”. There is also meaning behind its name: the ‘divan’ represents the traditional way of storytelling in the Arab world and ArtDivano spreads the story of art by and from the region, carrying the tradition into the present and to the future, according to Labani. ArtDivano’s latest in-house limited edition series of a fine art reproductions named ‘Beloved poetry, lyrics and fairy tales’ was launched a few months ago with calligraphy inspired by Khalil Gibran, which it commissioned to Bahraini artist Abbas Yousif. The next part of the series will draw inspiration from Qassim Haddad’s and Jalal Al-din Rumi’s poetry. The entire series will be showcased at the upcoming Art Bahrain fair which will be held at the Four Seasons Hotel Bahrain Bay from October 13 to 16. At the event, ArtDivano (Stand 32) will showcase a collection of paintings, calligraphy, sculptures and photography as well as fine art reproductions produced at its archival print studio. 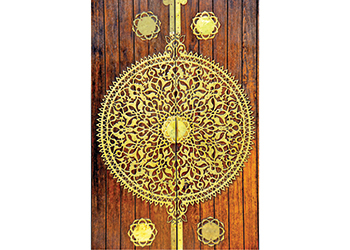 ArtDivano also recently introduced a fine art photography series entitled ‘Witness of the Past – Treasures of Bahrain’ focusing on the beauty of handcrafted old doors, which are disappearing from Arabian architecture. Reproduced on fine art paper in a limited edition, the series is available via the company’s instastore through instagram@artdivano and in the Museumshop at the National Museum Bahrain. Artwork at Double Tree by Hilton in Old Salata ... ‘topography’ theme. Labani and Zainalabedin says they draw their inspiration from art and creativity in the Middle East. The duo love to fuse traditional designs with modern western art concepts, as they believe “art brings people closer”. 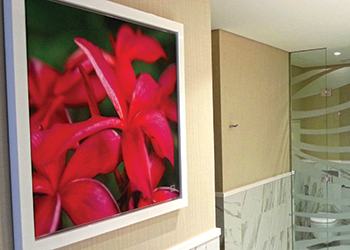 Apart from hotels, the company also provides artwork solutions to individuals such as art collectors. “Corporate clients are also most welcome to get in touch with us for all art-related services whether it involves renting artworks for special occasions or just redecorating their offices or conference rooms,” Zainalabedin concludes.